Home 2016 Forecasts, Forecasts, Get Your Forecast Here! Forecasts, Forecasts, Get Your Forecast Here! Everybody likes to make predictions, especially now, while we’re at the actual beginning of the “fall” campaign. So let’s take a moment to review some of the prognostications out there. First, let’s turn to OZY, with four unorthodox forecasts. Although they admit that an “October Surprise” could upend everything. The Ballots Will Add Up–There are rumblings that many GOP loyalists might stay at home on Election Day, which would mean a low turnout. I’m not so sure about that. I vote that by the time we have spent $6 billion in ads on this campaign, we could see the first American election with more than 150 million voters. To put that in perspective, the most recent elections have seen more than 122 million but fewer than 132 million voters. Plus, with a slew of new voter laws for early and easy voting as well as automatic voter registration in a handful of states, you can forget about low turnout. A large turnout would probably mean a lot of people who have never voted before. That’s not expected, so OZY says you should take the polls with a grain of salt—they’re based on outdated election theory. One Unexpected Group Will Punch Above Its Weight–Much has been made about how Trump’s candidacy will shift voters: Some lifelong Democrats will swing over to the GOP aisle and vice versa, and there is potential for record Latino voter registration and voting. One study suggests that Latinos could become a decisive voting bloc in a narrow race in as many as nine states this fall. Rep. Keith Ellison of Minnesota, Congress’ first Muslim member, argues that it’s high time Muslims did the same and organized into a voting bloc. There have been reports, especially in Pennsylvania of hundreds of thousands of Democrats registering as Republicans, and new voters going Republican. So the “unexpected” group could actually be white folk. It’ll Be Closer Than You Might Think–By now, the polls that predicted a Clinton blowout just a few months ago show that her lead has evaporated. I think that if Trump’s going to win, it will be because of his knack for going on the offensive. The billionaire has demonstrated he can make an argument or spout an epithet — just ask “low-energy” Jeb, “little” Marco and “lyin’” Ted — and his name-calling seems to help him move the poll numbers. Notwithstanding “crooked” Hillary attacks, and assaults on her gender, I think Trump has not yet begun to fight. In fact, OZY reminds us that two elections went to the House of Representatives to be decided, and four others, including JFK in 1960, were within 30,000 votes of being decided in the House. And with Gary Johnson, the Libertarian candidate already up to 13%, anything could happen. Keep an Eye on the Media–Candidates, the voters and key operatives determine presidential races, right? But every four years at least one journalist seems to have an outsize impact. In the 1980 election, it was Roger Mudd, when he made Ted Kennedy look unprepared with the simplest question: “Why do you want to be president?” In 1988, it was Bernard Shaw. In 1992, it was Larry King. In 2004, it was Dan Rather, who lost his job over [a 60 Minutes report he couldn’t prove]. Remember Katie Couric with Sarah Palin in 2008? Candy Crowley in 2012? OZY thinks it’s possible that Megyn Kelly—the Fox personality—could wreak vengeance on Trump. Imagine Fox making Hillary president. The prediction above says ignore the polls, but everybody wants to hear what Nate Silver, of FiveThirtyEight has to say. He’s suggesting Hillary is a shoo-in, but not as convinced as just two weeks ago. He’s now predicting that Hillary will win, with a 61.7% to 38.1% likelihood. But that’s down from 80% to 19.7, just three weeks ago. If she can’t stop that decline rate, she’ll have less than zero votes before election day. Meanwhile, gamblers are still betting on Hillary, but not like before. The current odds are 69.6% Hillary to 28.6% Trump. That’s better than two-to-one. But, just one month ago, the odds were 74.1 Hillary to 17.7% Trump, or more than four-to-one. That’s a “Yuge” swing in one month. Challenger charisma: The challenging party candidate is not charismatic or a national hero. . .
LICHTMAN: Right now the Democrats are clearly down four keys: The mandate key, which is based on midterm elections — they got shellacked in 2014. The sitting president key. Obviously Obama isn’t running again. The policy change key, which only applies to the second term, and there’s been no significant, lasting policy changes in the second term. And the incumbent charisma key. Whatever you may think of Hillary Clinton, she’s no John F. Kennedy or Franklin Roosevelt. That means this election will be decided by the two keys hanging fire: The contest key, No. 2, and the foreign policy success key, No. 11. It will not be decided by the debates, the speeches, the ads, the tricks of the campaign. Meanwhile, CNBC—the financial channel—thinks the stock market will tell all. 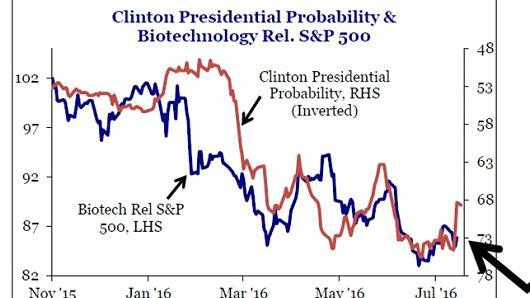 If biotech stocks continue to fall, it means we will likely have a President Hillary Clinton. The sector’s shares are perfectly inversely correlated to her chances of winning the presidency, according to Strategas Research Partners. How about psychic, B.E. “Betsey” Lewis? I decided to look at Hillary Clinton and Donald Trump’s numerology personalities with the word President added to their names. President Hillary Clinton would be a number 7, and seven is a spiritual number for those who have pure intentions. If not everything can come back to them like a boomerang–Cosmic Karma. Hillary’s negatives as President are: shrewdness, hidden motives, too much pride, suspicion, deceptive and cynical. President Donald Trump is a 9, which represents, compassion, charitable ways, brotherhood of mankind, leader in philanthropic endeavor, has big opportunity in life, capacity for living by divine standards, money attraction, but there’s the too much love of self, impulsive action, takes no blame, demanding approval and appreciation. I predict that if the presidential election is not rigged, Donald Trump will become our next President. Many things are taking place in secret that could create a huge surprise for all! Hillary and Bill Clinton are linked to several cabinet people who died mysteriously while Bill Clinton was President. Donald Trump has never been linked to any deaths. JUSTICE SCALIA MURDERED IN OCCULT RITUAL: On Feb. 25, 2016 The Washington Post wrote that U.S. Justice Scalia was involved with an elite secret society and also linked to the Bohemian Club, another occult group. He died on Feb. 13, 2016 and number 13 is a power number linked to the Illuminati. Read more about the number 13 in my book Mystic Revelations of Thirteen. According to Nostradamus illusion of specifically, ‘the false trumpet’ representing Trump who is concealing his own madness. Someone has betrayed him, so now, he is enraged. In the name of religion, he talks blood and ends up swimming in it. What is the land of ‘milk and honey‘? It is, obviously, Israel – he’s described his intentions of being a ‘neutral broker’ between Israel and Palestine. The last line indicates to what he said about his big show of friendship and dirt he received in return for his efforts. Such vague Nostradamus metaphors tend to have established interpretations. It seems like Trump is unable to get the Republic to go on expensive military adventures, so he asks Britain to do the work – this could be some kind of risky humanitarian thing that reeks of more immigrants. In fact, the US Senate has shown supports for Trump; yet, right after that, they stab him in the back. He’s impeached and ditched after four years, but then, ‘at the sound of the trumpet of his adherents there will be‘ points out that he plans to expel the enemies. Hillary Clinton will be 45Th POTUS by a very narrow margin (1%). Donald Trump will continually close the gap on Billary and eventually pass her in the race for president. Voters both Democrats and Republicans are sick and tired of the same old same old. Billary will essentially be a third Obama term, and I don’t think many people want that. The fact that she is a power hungry MEGALOMANIAC doesn’t help.? Donald Trump will be the next president!!!? You’re a good musician or a business man / woman or just any worker and you need excess money and you also want to be famous and rich here is your chance to become a member of the Illuminati and become a Star in your life. if you really are interested in becoming a full member of the Illuminati not hesitate for e-mail and we also want you to know that there is none which is to determine your future, because Your future is in your hands right to join us now and become a responsible human being, then email us now [email protected] OR YOU CAN CALL OR WHATSAPP US ON THIS NUMBER +2347062982173 if you are interested to become wealthy and powerful. This opportunity is set for those people who were thinking of how to become rich and famous as a Son Of Doom of the great Illuminati contact us now and be fully Initiated so we can tell you the nearest branch you can worship, come now to get In Touch with Wealth and Power there is nothing to fear about, we disclose it openly as because of those interested who has not gotten opportunity to join this is why we sent agents for Recruitment. So respond now to get rich. I thought the Nostradamus interpretation was dubious at best. It could also be interpreted as Trump beating Hillary and having absolutely nothing to do with Israel. Nostradamus lived 500 years ago. so the translations are suspect. the more wild the interpretation can be. Something quite unexpected will happen in the next 6-8 weeks which will cause undecideds as well as some Hillary supporters to switch their allegiance to Trump. He will win convincingly and his win will shock many pundits. Remember you heard it here first. Most people will be very shocked when Trump wins on Nov 8. I know the poll shows Hillary is way ahead of Trump. However, something very unexpected will happen about a month before the election. Just watch.